I have a family favorite to share with you today. My family loves Mexican food, and this is an easy weeknight dinner. The leftovers the next day are even better, and my family usually doesn’t like leftovers. In a large skillet, cook the ground beef or turkey, onion and garlic over medium heat until browned. Drain any grease. Add the chili powder, red pepper flakes, oregano, paprika, cumin, salt and pepper. Let cook for a few minutes over medium heat. Stir in the beans, corn, green chilies, tomatoes and enchilada sauce. In a greased 9 x 13 inch dish, tear 8 tortillas into small pieces and place in the bottom of the dish. Put ½ of the meat mixture over the top and then ½ of the cheese. Repeat with the remaining tortillas, meat mixture and cheese. Bake at 350 degrees for 35 to 40 minutes until bubbly. Wow! I love everything about this 🙂 Thank you for linking up – I’ll be sharing this on my FB page later tonight! This looks delicious! I LOVE enchiladas and Mexican food so I am pinning this for sure! I love meals that are easy and tasty. Funny how some foods taste better the second day! Gotta love those leftovers! No problem. I often have to catch up on my comments as well! Thanks for taking the time to stop by. Have a terrific weekend! Fantastic looking casserole that is very kid friendly, esp, teenage kids… I would love it if you brought it by my foodie friday party today. Thanks Diane! I’ll do that. It is great for teenagers. Thanks for the invite and have a terrific weekend! Yum, it’s kind of like a Mexican lasagne! Exactly! Thanks Kari for stopping by! Thanks Savannah! I’m off to check it out. We appreciate you stopping by for a visit! My kids love it as well! i made it. and i am beyond in love. this is amazing, over the moon crazy in love. going to try it with chicken next time. did i say i was in love. yeah, i think i did. 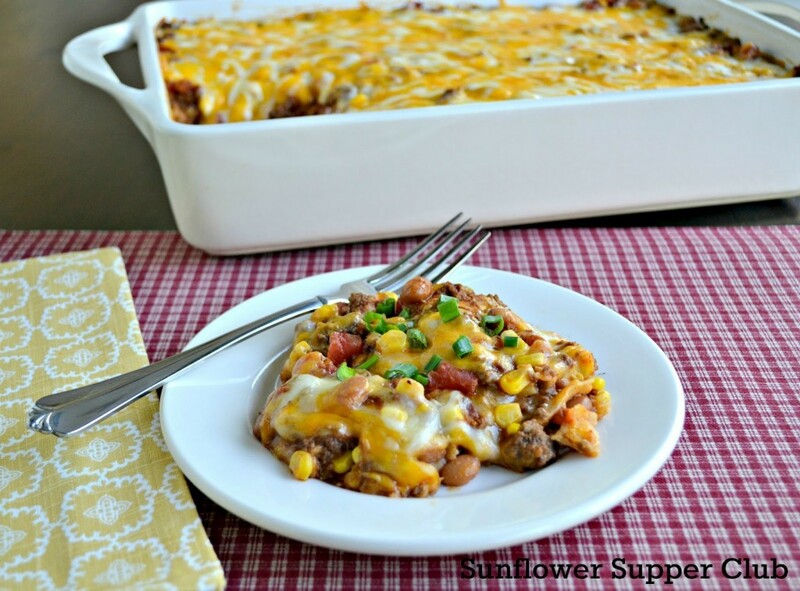 This is a fantastic Enchilada Casserole! What a great recipe! Have a great week and thank you so much for sharing with Full Plate Thursday. Big hit tonight at my house! My 6 yo says he wants it every week. Thanks! Thanks so much Alison! I’m thrilled he enjoyed it!